Arrival of a baby is a great moment of the life of parents and when a baby girl born, she brings more joy and happiness in the family’s life. It will be a happy moment for the parents, relative and the people near and dear one. So if you hear news of baby girl born, express the joy and send them good wishes or messages to make this day fuller of love and happiness. By sending them good wishes you can tell them that you are really care for them and very happy to listen the news for born of baby girl. 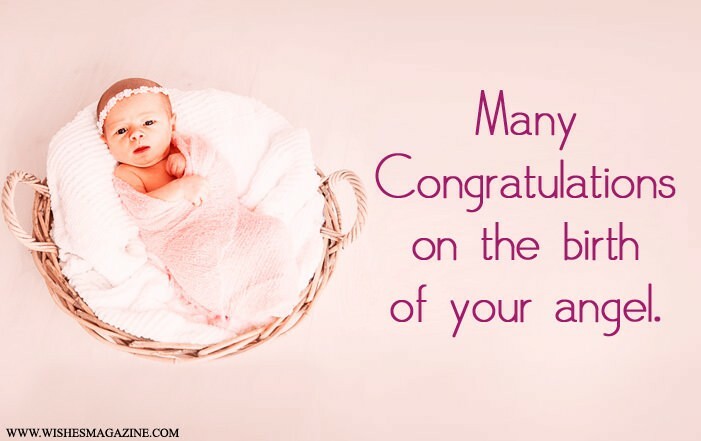 If you looking for best congratulations wishes for arrival of new baby girl, here we have a collection of Congratulations Wishes For Baby Girl, Blessing wishes for baby girl, Baby girl arrival wishes messages for greeting card, New baby girl messages for parents, you can share or send these wishes along with gift and celebrate the moment and share your feelings towards little angel. Time to celebrate beautiful moment of life. Congratulations on the birth of your beautiful baby, May God bless and watch over you, your baby and your family! Congratulations…I wish your house will soon fill with sweetness of your angel and cute toys. I wish God will shower all his blessings upon your cute baby girl. And fill its future with many smiles and joy. Many Congratulations on the birth of your angel, I wish every second of your life fill with pleasure of her cute smiles. I am so happy to hear the news of the arrival of a cute angel in the family. I wish her presence will make the way of happiness to come at your home! Celebrate and enjoy the happy moment of your little baby girl present. I wish you congratulations on the safe and happy arrival of your daughter! I wish the smiles of your loving and cute angel will fills your home with happiness and bring prosperity to your life. My best wishes on the birth of your cute baby! I wish she become the reason behind many years of love and happiness. My best and warmest congratulations are with you for the arrival of lovely baby girl. Congratulations! Congratulations for the lovely baby, I wish your future is going to be filled with affection and love of cute princesses and she fills your hearts with lots of little smiles. Congratulations for the cute baby, now your house will soon be filled with sweet similes of your lovely baby and imaginary characters of your dolls and toys. My heartiest congratulation for the little princess comes in your world. I wish you and your entire family many joy and happiness as you welcome this special blessing in to your life. Congratulation, I wish you endless joy for the birth of a little girl. I wish the every smile of the little princess make you world shine more brightly. Congratulation for the cute baby girl! Your heart and life will be filling with love and happiness of your angel. Congratulation for the born of cute baby girl!